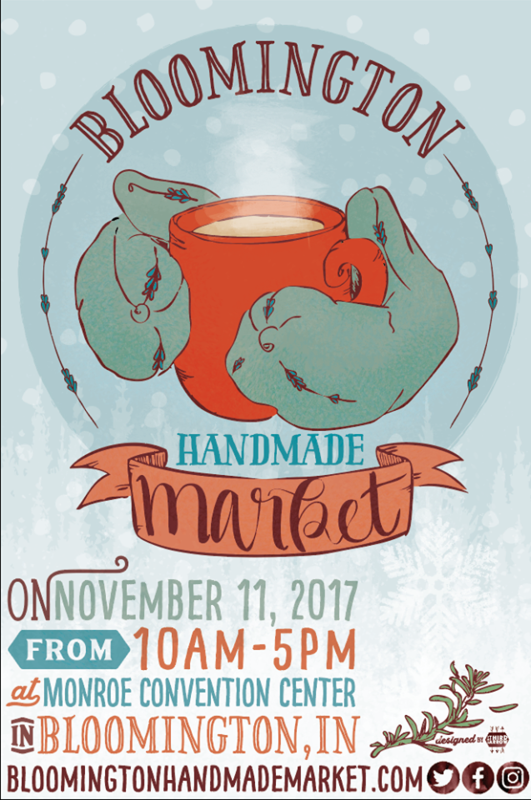 Our NINTH annual Bloomington Handmade Market was just a few weeks ago, Nov 11, at the Monroe Convention Center. I can't say enough positive things about the Market this year (and every year really), but I will try. To begin with, we have a rock star team with Jaime from JO Designs who's been with us for a few years now (unfortunately this was her last market with us as she's moved to a town over and has a full time job! ), Chelsea from Tactile Melodies who has also been on the team for a bit (and thankfully is staying put for at least another season! ), and Jackie (my bff and from the former Bea's Soda Bar) who is unfortunately also taking retirement from us after this season). Without these amazing humans BHM would fail to be the success it is, and I owe soooo very much to them! Also, on that note - if you're interested in joining the BHM 'board' (i positively hate the term 'board' bc I can't possibly run something that serious) shoot us an email over at bloomingtonhandmademarket@gmail.com with a little something something about your interest and what you could bring to the table for helping to organize such a rad event! After the team and that immense thanks that goes to them, it's really important for me to brag on the team at the Monroe Convention Center. Ever since I took over the BHM a few years back (I can't really count, so don't make me) I've become rather close to those that make the cogs turn over at the Convention Center. First it was April, and now it's Lisa and Evan, occasionally Jean, sometimes Talisha and even Patti -- and they're ALL wonders to work with. I know of some other Convention Centers around that host events like ours, and I can't imagine a nicer, more down to earth, approachable team that I CHOOSE to work with year after year. Even if/when my vendors are craving coffee and it's running low and I haven't been as nice as I could have been because I was running on three hours sleep and the map somehow always changes between planning time and actual show time and I forgot to put bottled water on the list and we run our of swag bags in the first (what seems like) 2 seconds of the show....even then, in all my chaos, they keep calm, and carry on. Bless you. And, since we're talking about teams. Tribes. Families. Villages. Let me go on to thank the amazing tribe that is the makers, crafters, artists, PEOPLE behind what makes the Market REALLY tick. This year we welcomed in more than 80 humans that make things. From the Lobby to the Great Room we filled that space with talented humans who kept smiles on their faces, who spread those smiles through a room with their laughter, their products, their stories, and quite simply, their presence. We had new to us artists that had never visited Bloomington before and we had artists that have been joining us from the very beginning. We had emerging artists from Bloomington that had never done a show before, and seasoned artists that make a living from this thing called art. Thank you. Thank for for making us part of your season. Thank you for making us part of your story. And then, there's you. The people that came. The people that started lining up before 9am to get in line for a swag bag, but also to get in line to take first crack at all that beautiful art. Thank you. Thank you for continuing to come out to our Market each and every year - to see what's new, to meet the artists behind the art, to say hello to me and my team. You are amazing, and awesome and we Love you, more than you can possibly know. As I'm writing this I realize I should have written this over at the BHM blog - and so I'll do that - I'll do a little cross posting so this gets seen by the right people. But, we have a little secret, and a not so little secret to share. The reason this is here - on the Gather blog - is because, if you didn't know - we run the Market. Gather would NOT exist if not for the Bloomington Handmade Market. And so, each year, twice a year, sometimes more I sit back and reflect on that and what got us here -- to this very moment; A moment wherein I'm still recovering from the BEST Black Friday/Small Business Saturday of our lives. Sometimes people don't know the connection - that we are, essentially, at this point - one in the same. So, here we are. And second - for the little secret - we're going to be undergoing a REBRAND in 2018 for our 10 year anniversary! Our website will be getting a complete overhaul, along with our logo and our overall look -- and WE CANNOT WAIT!!! But, wait . . . there's more. I've alluded to this a bit, and the powers that be (who give out grants and the like in this grand ole city we call Bloomington) of course already know, but we will be moving our Spring Market from inside Fountain Square Mall --- (are you ready......can you handle it....) to the Street (for an outdoor event) in the early Summer 2018. We are a Bloomington Indiana print shop focusing on hand screen printed goods, merchandise, and fine art. Our primary customers are local business, organizations, and bands. Smollthings is a paper and clay studio that specializes in pen and ink illustrations that are transferred to wheel thrown pottery using a glazing and etching technique. All illustrations and pottery are handmade by Tracy Smoll. Brainchild Conspiracy repurposes yesterday's items into today's useful household goods. Through upcycling Brainchild breaths a second life into goods that otherwise would be forgotten to time. Everyone loves a great bar of soap—find yours at Get Lathered. Opened in 2008, Get Lathered offers an entirely handcrafted line of soaps, lip balms, and solid shampoo/conditioner bars, all made by Rhonda Frye, in Indianapolis. Get Lathered is dedicated to providing products with a high level of wholesomeness, richness, and beauty. The Wood Frog is a family run farm and woodworking business located in beautiful Nashville IN. They feature unique gifts, traditional wood games, and unique furniture pieces designed to reflect their natural lifestyle. Wood is sourced locally and when possible from their own land, with Scott hand picking pieces to showcase their natural beauty. Off the Hook Accessories creates unique, fashionable crochet apparel for the entire family. Hats, headbands, cowls, shrugs, boot cuffs, leggings, and so much more. We go beyond grandma's crocheting. Ohmmygolly Press was born of a love of merging beautiful craftsmanship and utilitarian objects. Founder and artist, Brittany Davis, has a personal belief in the power journals can hold, and binds every book she sells by hand. PerlerTricks is the geeky, 8-bit work of art teacher Brian Harmon. Using plastic fusible beads, PerlerTricks creates pixel art home décor, magnets, and accessories. Each piece is an original PerlerTricks design taking reference from pop culture and art history. Every bead is placed by hand on pegboards then fused with an iron prior to being framed or fitted with a magnet or jewelry findings. dRock Press prides itself in being accessible to the masses. A combination of a nose to the grindstone work ethic, large editions, never ending sources of inspiration, and a belief that if you love the work you should have the opportunity to take it home with you. Face Plant is all-natural, plant-based organic skincare--plant nutrition for your skin! If you wouldn't put in your body, why put it on your skin? POLYGONS+Peonies is a thoughtfully crafted shop with a modern and whimsical aesthetic. Inspired by the handmade clothing from my childhood, the eclectic mix of products focuses on a love of bold graphics, unique color combinations, and granny chic. My greatest joy is seeing my pieces climb fences, fly down slides, and twirl through the grass because piece is constructed to compliment childhood. The Virtuous Bee is a one woman show in Bloomington Indiana. Local beeswax and honey are central to all the handcrafted natural and mostly organic bath and body products. Body butters, salves, soaps, lip balm, deodorant and even a biodegradable reusable alternative to plastic wrap make up the list of high quality goods.